Following adversities, we have thrived to build better health for ourselves. Karen’s battle with cancer is an all too familiar diagnosis. Her commitment to nutrition and wellness is the outcome of Karen’s unwavering determination to restore her ravaged body to optimal condition. Kathy says, “I was desperate for change”. Her battle with obesity forged a campaign to change every aspect of her life. Her weight loss and renewed zeal for life was acknowledged when she was named a Shaklee 180 Healthy Competition Winner. Their journeys made them aware of the role that nutrition and environment played in their health. Kathy and Karen feel twice blessed. First, for what they have learned through tears and laughter. And second, for the opportunity to share with you! 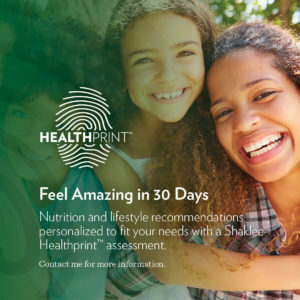 Complete your personal Healthprint assessment ~ a powerful free tool that we offer to help you identify your top three health areas, then we will give you some personal insights and recommendations that we can discuss by phone or email to make sure you are creating a plan that is perfect for you. Want to learn more before you start? We invite you to browse our website. Our goal is to help you reach your health goals naturally with up-to-date information, personal attention and exceptional products. It’s all about YOU! Let us know how we can help.